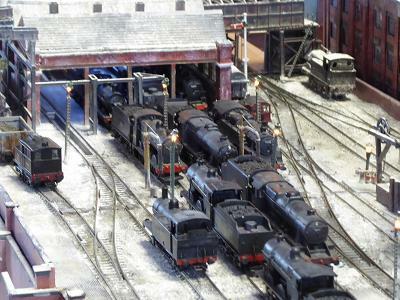 My model railway, the locomotive shed 79A is situated in the north west of England sometime in the 1950's. The location is fictitious. The shed building and tracks are located on raised ground, below are arches some of which are occupied. An access ramp up to the shed workshop gives road access to the site. Trams are still in use. Demolition is taking place on the opposite side of the arches access road as the developers have moved in. The depot location is close to a main station serving the city. Rail traffic is heavy as the city has a goods marshalling yard and a wagon repair facility. In 1949 the LNER shed closed. As the city is still served by Eastern Region trains LNER locomotives are now serviced and turned at 79A. Traffic in and out of 79A is constant, requiring various locomotive movements, commuter, cross country and intercity expresses can all be seen. Goods traffic, local heavy and semi fast as well as shunting requirements are also frequent. Visiting express locomotives and heavy goods from both regions visit 79A for servicing. 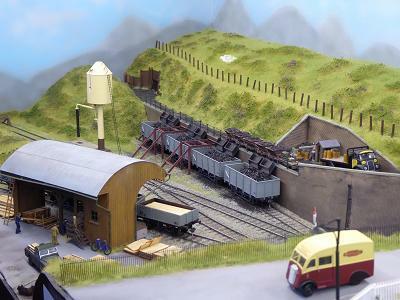 Situated somewhere in the Forest of Dean, Bicsdale is a fictional place where one of the typical drift coal mines is operating in the Forest in the 1950's. 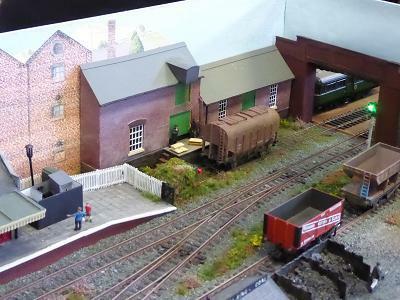 Originally built to serve a somewhat remote nearby small township, the mine has a connection from the Ross and Monmouth Railway and there is still plenty of passenger traffic with station facilities and a timber merchant also on hand. The extension into the yard through the bridge to the side of the tunnel entrance was formed when Bicsdale number 1 drift (this now closed the entrance can be seen close to the coal drops), was found to be capable of producing sufficient coal to export via the railway. Later on the mining operation was transferred to number 2 drift and the tramway runs off scene towards that entrance which is still in use. Pointwork is all handbuilt using C&L components these are matched to their flexitrack. Operation is completely DCC, including point control which is managed by JMRI and normally controlled using tablets and smart phones. All stock is fitted with Kadee coupling for ease of shunting. 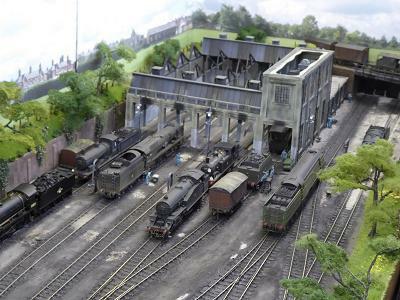 The layout depicts a leafy corner of the railway network towards the end of steam, it represents a simple goods yard. My model railway is that type often referred to as a "shunting plank", this is my take on the genre. Buildings are all taken from real examples, with the track plan configured to allow future expansion. 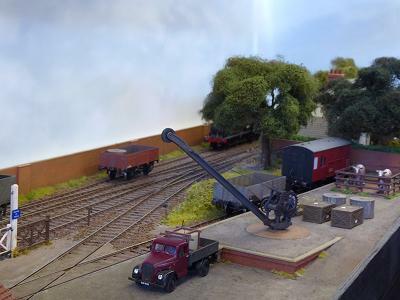 To add variety to the shunting activity there is also a working yard crane and access gates, this allows a radio control lorry to be loaded from the wagons in the yard. 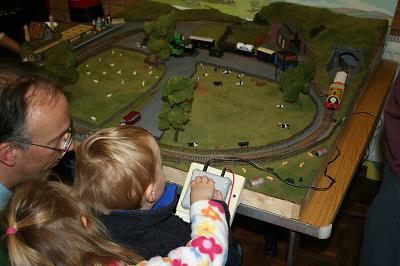 Another unusual facet is that the locomotives used in the layout are all battery powered and operated by radio control. Set roughly in the Eastern Region it is as generic as possible so that Southern and Western Region stock does not look out of place. This allows the running of a variety of rolling stock which in future may also include some early diesels. Welsh name, Eastern Region leanings?? 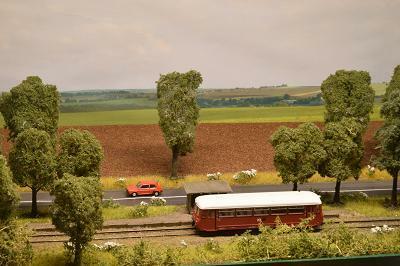 I was struggling to give the layout a name ahead of its first exhibition so I decided to call it after the cottage on the right hand side of the layout which happens to be my home. The town of Castlederg is the settlement at the terminus of the Castlederg and Victoria Bridge Tramway. The railway was built in 1884 as a three foot roadside tramway to connect the town with the Great Northern station seven miles away at Victoria Bridge. It closed in 1933 following a railway strike. 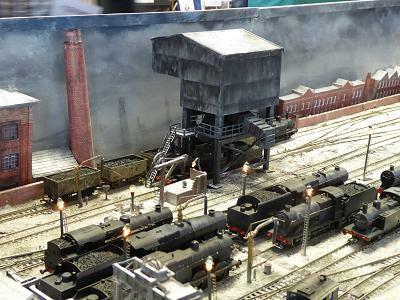 All locomotives with one exception are scratch built, the rolling stock which you see has been built in its entirety from Worsley Works kits. 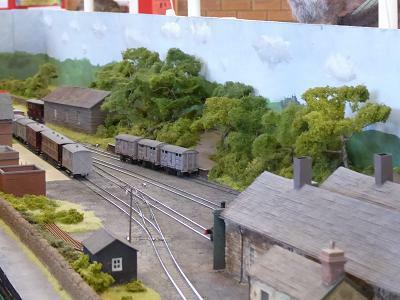 The layout is 12 feet long and two feet wide and is self supporting, a crate of Guinness has been known to assist with the Irish ambiance on the model railway. 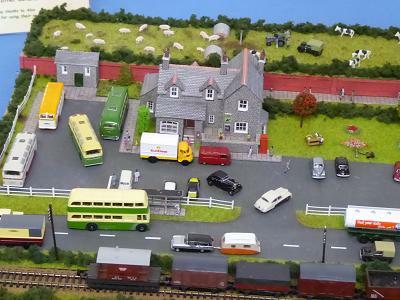 Any questions or observations on Irish railways and modelling is gratefully received. Rea|ity ... until October 3rd 1940 the LNWR/LMS had run an electric passenger service from Willesden Junction to Earl's Court. Many railway companies had, at various times, operated services over the West London Iine some of which continued via Earl's Court. The Mode|... assumes that the LMS and GWR had built their own joint station at Earl's Court. This enabled them to divert some of their commuter and local passenger trains away from Euston and Paddington. Services had continued into the early 1960's, when the model is set. As well as local services and peak hour commuter trains there is a small parcels depot and a shunt road which leads into the nearby dairy. 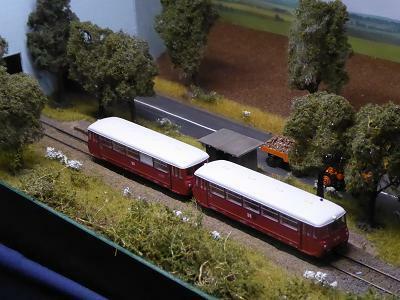 There is also London Transport stock to be viewed on my model railway. 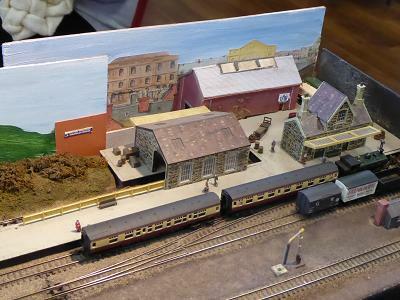 The buildings are kit bashed or scratch built and most are loosely based on photographs from the era. Much use has been made of resin castings, which I produce myself. Locomotives include ready to run, scratch and kit built. All are detailed and weathered and fitted with sound. 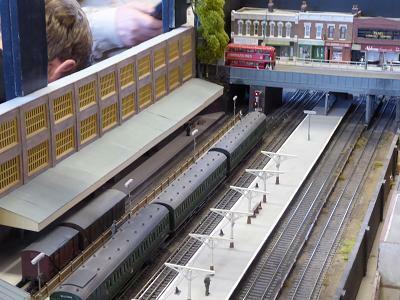 Earl's Court has been featured in Model Rail, British Railway Modelling and Railway Modeller magazines. In my younger years I used to do my trainspotting around Feltham Motive Power shed. Later, in my working career I was employed as a fireman there in the 1960's until the end of steam. 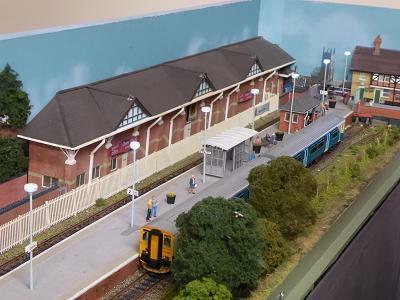 For this reason I decided to build my model railway as Feltham Road MPD shed. The model track plan is not the same as the prototype, the era is anytime from the 1950's to the end of steam in 1967. Baseboard size is 8 feet by 2 feet, the scenic area being 6 feet with a 1 foot sector plate leading to a storage sidings. The legs fold up underneath. I have used a Dapol turntable, it has been altered a little bit. I have roller bearings as wheels and a thrust bearing in the centre shaft to make it run more freely. Operation is by a stepper motor with electrics from Model Electronic Railway Group (MERG). Train control on the layout is also by MERG DCC control system connected to a Raspberry Pi (mini computer) with JMRI, so it can be controlled on my mobile phone or iPod. Points are operated by servo motors with MERG servo boards but these are not DCC operated, I use toggle switches with frog polarity to help running. Track work is hand built with C&L components. I cut the sleepers from 0.8mm thick plywood on my band saw and dyed with wood dye. The track plan was drawn on template, a CAD program, not an easy piece of software to master. The buildings are all scratch built with plasticard. 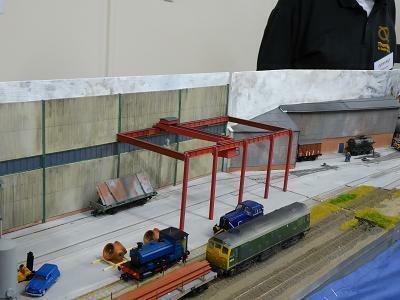 Feltham MPD shed was made of concrete, my model shed is a plasticard construction but the same basic design. A couple of differences are Feltham was a through shed with six roads, I have done my version with four roads. Plus on the original the repair road was on the left, the ash in the disposal pit and on the side is lit up with MERG twinkling light kits. Garfield is a fictional town in the North Cotswolds at the end of a joint London Midland & Scottish and Great Western Railway branch line. The small terminus station has a limited passenger service connecting with trains to Banbury, Rugby and London Marylebone while a small factory, coal merchant and near by quarries generate freight traffic. On this its first public appearance, Garfield will be set in the 1930's but could also represent earlier or later epochs. 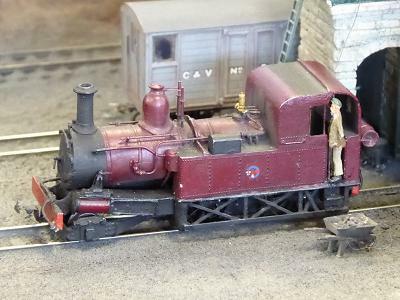 The 6 feet by 15 inch layout was the last to be built in OO gauge by George Lowell of Clevedon. I am indebted to Mike Walker, Robert and Roger Webb and everyone else who has contributed to this project. By the way can anyone find Garfield the ginger cat? Grunöw was a halt on the Prenzlauer Kreisbahnen, a 84 kilometre long minor railway network in Brandenburg, approximately 100 kilometres north of Berlin. The line opened in 1902 operating as a private railway until 1943 when control passed to the Brandenburg state transport authority. In 1946 the line was taken over by Deutsche Reichsbahn, (DDR, East Germany), they operated the network until the formation of Deutsche Bahn AG in 1994. Some sections were closed in the 1970's, however the route through Grunöw, from Prenzlau to Locknitz remained open until 1995. Services were cut back to Damme in 1991. This model represents the final couple of years of operation, with some liberties being taken until I can ascertain what freight traffic the route carried. 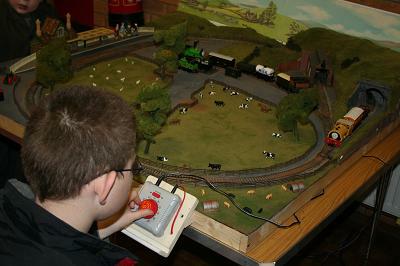 Trains are DCC controlled with automation by RocRail software. The hardware is a combination of MERG, Gilling Computer Associates and home brew devices. 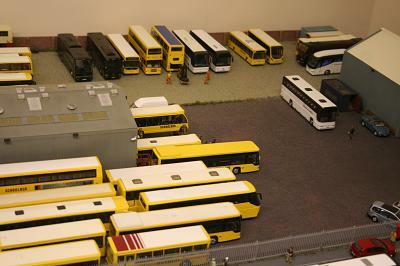 Movement of road vehicles is achieved with Magnorail. The M Shed is the home of the industrial collections of the Bristol Museum, based in the last warehouse in use on the Cities docks basin. It includes Bristol Harbour Railway which runs from the M shed to SS Great Britain along the dockside and to Ashton Bridge along the New Cut. M shed today offers "a train trip on Britain's only dockside steam railway behind one of our Bristol built locomotives." The layout shows those trips and other activities around the harbourside. 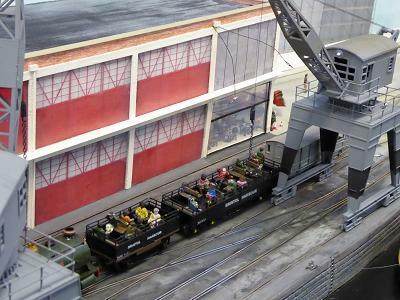 Don't miss the working steam crane, dockside crane, wagon hauling capstan and other museum items. There are also four eating establishments, although I doubt your hunger will be satisfied! I built the layout as an entrant into the EM Gauge Society's 60th Anniversary Challenge, although since then the length has been doubled to include two stations. I have taken some liberties with the actual track plan in order to fit a working representation of the shed and railway into the space allowed. Locomotives include an example from each of the Bristol manufacturers, Peckett and Avonside. Together with the Ruston diesel these normally work passenger trains. Other vehicles include the passenger train as operated today and a selection of others that could have visited the docks in the past. Made Upton is a fictitious Worcestershire town. 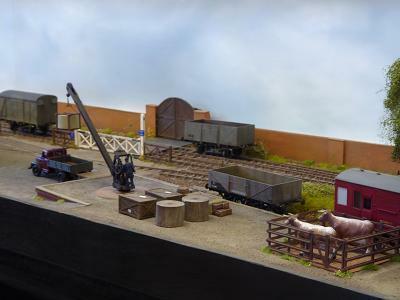 The layout depicts a terminus station, set in the present day, with a small but busy servicing and fuelling depot, plus a siding for loading and unloading goods to a distribution warehouse. A little imagination is required since in reality none of these facilities would be likely to exist at the end of a rural branch line in modern times. The trains that run are all loosely based in the present day, but there are a number of exceptions where modellers licence is used. Central Trains ceased to operate in 2017, plus Transrail disbanded in 1996 becoming part of EWS and there is even a class 20 in BR blue, just because we like the sound they make. Passenger services run regularly, operated by First Great Western , Arriva Trains Wales, London Midland and Central Trains. Diesel locomotives from many different franchises stop by for a quick service and some fuel. Goods wagons are regularly shunted in and out of the siding for the distribution warehouse by the resident class 08. There is also a postal service, which is probably the biggest liberty in a modern era layout as they were largely withdrawn in the mid 1990's. The trains are all DCC controlled, some have sound fitted. All of the other electrical stuff is normal DC, points are manual using piano wire rods. 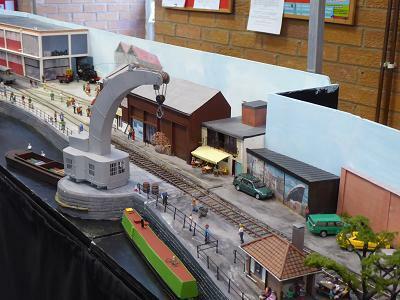 This was the first layout we built to be exhibited, so we hope it is up to scratch and that you enjoy watching. 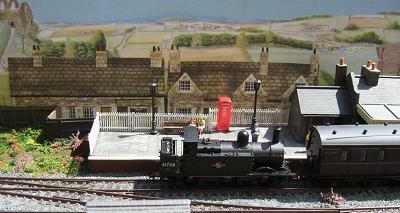 Matley is a N gauge layout depicting an English rural railway line. The total length in a straight line format is 7 feet long by 1 foot wide. Operation is from behind the layout. 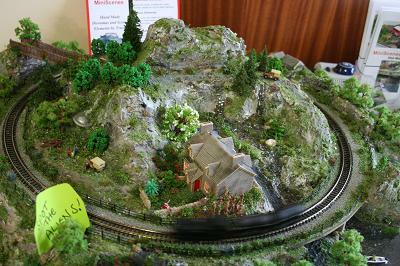 Running on this model railway is a variety of locomotives and freight wagons. 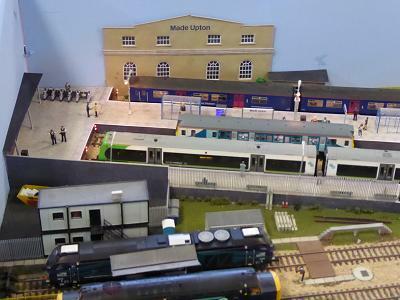 At one end trains are brought into the station and at the other the line terminates in a shed and fiddle yard area. Matley currently uses electro magnets for hands free coupling and the points are operated using wire in tubes. The layout has a generic theme to allow a range of club members stock to be run. 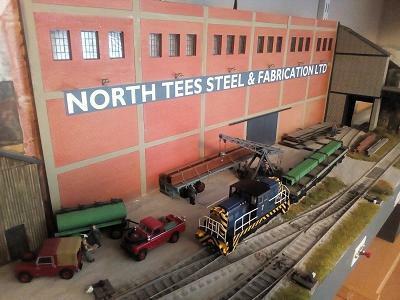 North Tees Steel is a double ended shunting plank layout, built as a tribute to the heavy engineering and fabrication industries which used to exist on the north bank of the River Tees in Stockton, County Durham. 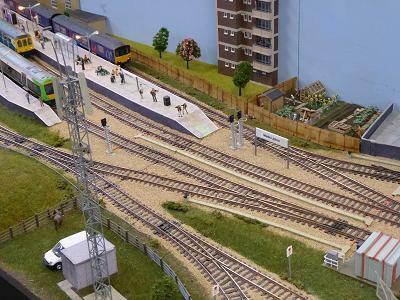 Steel and other raw materials are tripped from North Tees Junction, arriving from the left hand side of the layout. Freight rolling stock can be dropped off at North Tees Steel or continue to other plants further up the branch. Completed products are collected on the return working. Shunting within the complex is carried out by a typical mixture of privately owned industrial locomotives. 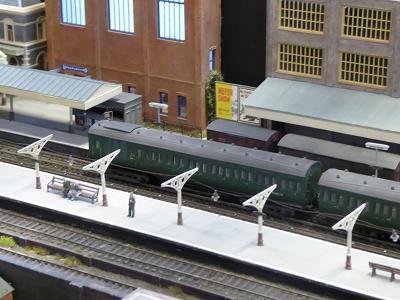 Locomotives and rolling stock are typical of what could be seen in the early sixties in the north east, they are a mixture of scratch built, kits and ready to run items. A feature of the layout, still experimental, is that the fiddle yard cassette is part of the scenic section. 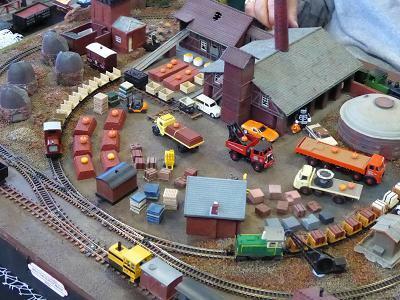 My layout the Old Time Brickworks features a narrow gauge railway serving a brick manufacturing plant. It is entirely fictional, set somewhere in England. It has been inspired by several real life brickworks that were served by a narrow gauge railway. Examples are Bursleden in Hampshire and the Old Kiln Light Railway in Surrey. The setting is almost timeless, but the vehicles date it to around the 1960s and 1970s. 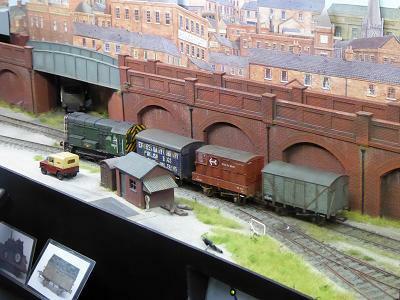 The Fiction behind the layout is that a group of enthusiasts have taken over a derelict brickworks and are resuming production for the specialist heritage market. They have also restored the narrow gauge railway, they now use a variety of small diesel locomotives. The main manufacturing building needs some more repairs and the site still has a slightly unkempt look about it but this is in keeping with the early days of the restoration in many narrow gauge railways. 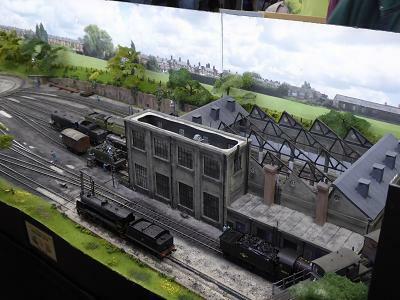 The Facts about this layout are that the main building which gives the model its name is a Playcraft kit (B805) this was bought in the 1960's and was found in an attic nearly 40 years later. 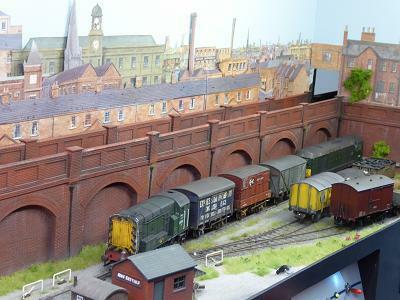 The Round and the Beehive Kilns are from an American company called Model Rail Stuff, they were bought about 15 years ago. It is designed to be simple, featuring only one track, being relaid in 2018, a continuous loop operable in either direction, with two sidings within the loop and one outside, which has a reverse head shunt. The track is mostly Peco N gauge Setrack, hidden beneath much ballasting. 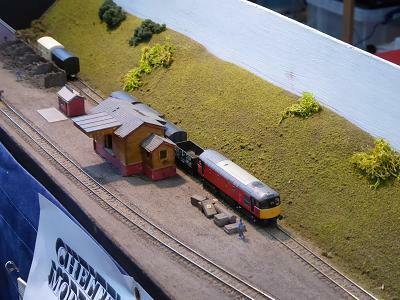 Motive power is mostly provided by new Minitrains diesels and the wagons are Roco, with a Liliput bogie van usually stabled next to a small goods shed. Occasionally coal wagons arrive to provide fuel for the brickworks and there may sometimes be a special excursion passenger train. The stacks of bricks and pallets come from a variety of sources, as do the road vehicles. The design is based on an Inglenook Shunting Puzzle and was drawn and redrawn many times to get it all to fit within the area whilst shunting with a Diesel up to Class 20/25. The track is hand built, using SMP parts and rail, directly on to the plan. All points are Ys but are different radii (e.g. 21 inch/24 inch). The base board parts were cut to size by a local building supplier from off—cuts and they only charged £9. Stock is mostly Bachmann with two sets, one has modified couplings for hands free uncoupling. The other set has been fitted with finescale (3mm) Sprat & Winkle; the S & W advice is not to use them below 36 inch radius, however they are being used here at 21 inch, but need careful setting. Control can be DCC (with sound) or DC (analogue). I find the concentration using DCC to be much harder than analogue for such a small layout and therefore sometimes like to fall back on analogue to relax. I like to think of Snug End as a Compact Layout although strictly speaking it falls within the Micro Layout category.